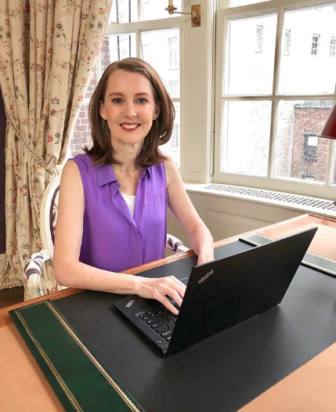 OPUS for Person-to-Person invites members of the community to hear #1 New York Times best-selling author Gretchen Rubin discuss her new book, Outer Order, Inner Calm: Declutter& Organize to Make More Room for Happiness, while supporting the Emergency Fund of Person-to-Person. The OPUS Spring Luncheon, sponsored by Barrett Bookstore, takes place from 12 noon to 2 p.m., Tuesday, April 2 at Woodway Country Club. Tickets are $110 per person, which includes lunch and a signed copy of Outer Order, Inner Calm: Declutter & Organize to Make More Room for Happiness. In Outer Order, Inner Calm: Declutter& Organize to Make More Room for Happiness”, Rubin turns to the challenge of creating outer order with clarity and humor. Think of the countless TV shows, hacks, Pinterest boards, and stores dedicated to helping us get our “stuff” under control. Rubin helps us create the peaceful, orderly environment that we crave. For many of us a messy desk or crowded closet can seem like a trivial problem, but when we deal with our possessions we feel both calmer and more energetic. When it is easier to hang up a coat, it is easier to go to the gym. An orderly desk makes it easier to write that challenging email. However, this book isn’t just about organizing your kitchen cabinets or your office files; it’s about creating more happiness. Outer order helps us focus our attention, time, energy, and money on the tasks, people, places, activities, and values that matter most to us. Gretchen Rubin is one of the most influential writers on the linked subjects of habits, happiness, and human nature. She’s the author of many books, including the blockbuster New York Times bestsellers Better Than Before and The Happiness Project. A member of Oprah’s SuperSoul 100, Rubin has an enormous following in print and online; her books have sold more than 3.5 million copies worldwide in more than 35 languages, and her popular daily blog, gretchenrubin.com, reports on her adventures in pursuit of habits and happiness. She also has an award-winning podcast, Happier with Gretchen Rubin. Rubin started her career in law and was clerking for Justice Sandra Day O’Connor when she realized she wanted to be a writer. She’s been interviewed by Oprah, eaten dinner with Daniel Kahneman, been written up in The New Yorker, walked arm in arm with the Dalai Lama, and appeared on the cover of two (small) magazines. Her book The Happiness Project was even an answer on the game show Jeopardy! She lives in New York City with her husband and two daughters. Tickets are now available on the OPUS for Person-to-Person website. Reservations for tables with eight seats are also available for purchase. Proceeds from the OPUS Spring Luncheon will go to Person-to-Person’s emergency fund, which provides emergency financial assistance for security deposits, rents and utilities. For more information about the OPUS Spring Luncheon, please contact Kristen Smith at krsiten.wright.smith@gmail.com. For more than 20 years, OPUS, a volunteer group within Person-to-Person, has supported the Norwalk and Darien-based agency through fundraising efforts and public awareness. Last year, nearly 25,000 people received assistance from Person-to-Person including food and clothing, funds for scholarship and camp programs, layettes for babies, emergency financial assistance, a holiday toy store and much more. For information on this growing group of more than 200 women, and to learn how to get involved, visit the OPUS for Person-to-Person website.